A big classical American car, huge and powerful engine and a movie legend. A car with soul, a car with a fantastic sound, a car with a movie history and a story, the right dream car for Transformers fans. That all is Chevrolet Camaro. 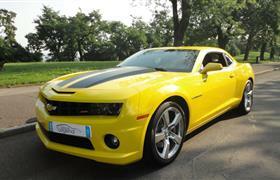 We offer a great 2SS model with a RS package in a legendary yellow color with black stripes.